JetBlue Airways saw traffic increase by nearly 8% during the month of March the carrier reported today, on a capacity increase of 12.6%. Load factor for March 2019 was 85.3 percent, a decrease of 3.7 points from March 2018. JetBlue’s preliminary completion factor for March 2019 was 98.4 percent and its on-time performance was 73.8 percent. First quarter RASM (a) is expected to decrease approximately 3.1 percent year-over-year, versus our prior guidance range of negative 1.5 to negative 3.5 percent. Higher than expected completion factor negatively impacted first quarter RASM by approximately 0.75 points. CASM ex-fuel (b) growth for the first quarter is expected to be at or below the lower end of our initial guidance range of 1.5 to 3.5 percent. Higher than expected completion factor similarly reduced CASM ex-fuel by approximately 0.75 points. JetBlue expects the price of jet fuel for the first quarter to range between $2.05 and $2.06 per gallon. Our fuel consumption is expected to be broadly in line with our original guidance of 215 million gallons for the quarter. 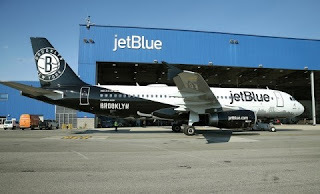 JetBlue is New York's Hometown Airline®, and a leading carrier in Boston, Fort Lauderdale-Hollywood, Los Angeles (Long Beach), Orlando, and San Juan. JetBlue carries more than 42 million customers a year to 100+ cities in the U.S., Caribbean, and Latin America with an average of more than 1,000 daily flights.